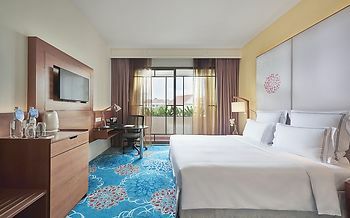 Hotel Swissotel Merchant Court, Singapore, Singapore - Lowest Rate Guaranteed! Coffee machine sometime not work. It's just a great location. For the price, it was a pretty small room. The sliding glass door arrangement in the bath/shower easily leaks water onto the floor. I was really impressed by the staff. Nothing was too much trouble. They were always helpful and cautious. I saw a safety issue in the bathroom whereby the floor level was some 3-4" below the base of the bath so that when you step out it was difficult to realise the depth perception and I nearly fell. I am sure that someone older and less agile would most likely have fallen. There is also no toilet brush provided and as everyone knows there are some occasions where a brush would be handy to save some embarrassment. Very well located on Clarke Quay. Very close to lots of restuarants etc and an MRT station is on the doorstep to reach other Singapore attractions. Bathrooms are very dated (15 to 20 years old maybe?). Urgently in need of a refurb. I may be being a bit picky but at £160 per night you expect a bit better from an international hotel chain. Otherwise hotel was fine. Mohamed at reception/concierge was extremely helpful confirming our onward flights, all concierge staff were great. Breakfast buffet is sensational, at market cafe venue. However we had executive club rooms and it was not worth the extra cost, and club room breakfasts were limited, so we switched to the market cafe. Was also noisy from executive club venue as our bedroom was directly below, and the constant scraping of tables and chairs above our heads was disturbing. My 3rd visit to this hotel, but will try another hotel on next visit,. Laundry costs very expensive. It is consistantly good each and every time that I stay there. Nothing that warrants a mention. I have stayed here several times in the past and it is very convenient for access to the city and a wide variety if eating places. The rooms are very pleasant, spacious and well equipped.